Removal and replacement of slate roofs on the Cathedral and Parish House. Removal of existing gutters, fabrication and installation of new copper gutters. Shore façade, remove brownstone pieces, remove masonry backup, fabricate and install new brownstone pieces, install new masonry backup, install new brownstone. Cut and re-point the entire façade. Patching of deteriorated brownstone on the entire façade. Miscellaneous Dutchman replacement on the façade. Removal of coping stones, installation of reinforcement, flashings and re-setting of coping stones with dowels. Washing of entire masonry facade to remove construction debris and staining. Miscellaneous replacement of missing, cracked and loose slate shingles with new slate shingles on the Cathedral Annex. 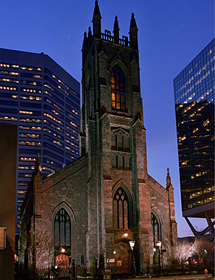 Erected in 1825, this brownstone church is located in the heart of Hartford. Christ Church began first as a parish church in 1795 and became the Cathedral of the Episcopal Diocese of Connecticut in 1919. G.L. Capasso Inc. was contracted to perform the façade and roof replacement of this historic structure. Deteriorated finials were removed and new finial stones were fabricated and installed. Each finial stone weighed over 500 pounds and installed using cranes. The entire façade was cut and pointed. Due to the irregular size of the joints, seven inch grinders and ten inch saws were used to remove the old mortar. New slate roof and sheet metal flashings were installed on the Cathedral and Parish House. Work was completed safely, on schedule and to the satisfaction of the church and consultant. Photo by Robert Benson with permission from Christ Church Cathedral.